F1 - A Privilege To Teach Your Children! This year is coming to an end and it has been such a privilege to be part of our children’s educational journey. Our big children are leaving us to embark on their new chapter in F2 and they are more than ready, although I’m not sure all the parents are! We get to keep our N1s for another year and will be joined by another three intakes throughout the course of the year. No wonder Mrs Fenton and I are grey! This year has been filled with thousands of milestones that have been achieved by our wonderful children and these are not just in reading and writing but in the prime areas, that are so important for our children to develop into rounded individuals. They learn to share, make friends, have conversations and LISTEN to others. They learn about themselves and what they like and also what they don’t like (with many of them, that usually involves tomatoes!) They can talk about themselves and their family and share all the things that go on at home. Nothing is sacred! They learn to concentrate on activities that previously they wouldn’t have had the patience for, and they make connections and links with their learning and if imaginary light bulbs existed, we would see lots of these flashing around our unit. These children are all amazing individuals and are unique in their own way. They learn and develop at different rates and as I often say, it’s not about the race to the finish line but the journey itself. Many children enter nursery unsure of what lies ahead, scared to leave Mummy or Daddy because three hours is such a long time in a little person’s life. But with reassurance and lots of love, they find their feet and in no time at all begin to flourish because they are amazing! This year has been full of moments that make Mrs Fenton and I realise why we are in such a fabulous job working with little people that provide us with dollops of joy on a daily basis. We have made so many memories that are not only documented in the thousands of photos I have and many blogs, but also in our hearts. Carry on being amazing and growing into the wonderful grown-ups that I know you’ll become. Enjoy your holiday and come back ready for the challenges that next year will bring because you are more than ready to meet them head on! We had our final Tree-mendous Tuesday adventure and this week we visited Langold Lake and looked at our local environment. 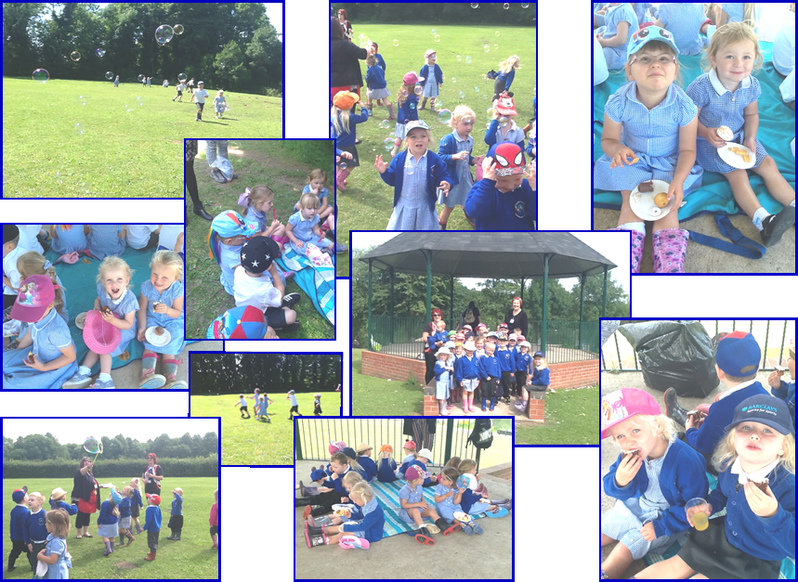 But as it’s nursery we decided to have snack breaks to keep our energy levels up because it’s a long way around that lake! We had ice pops, apples and picnic food. Thanks to our amazing parents for their donations. Then there was more fun as the bubbles came out and our friends chased around trying to catch them with lots of giggles and excited screams and it wasn’t just Dylan! Thanks to all our helpers, not just today but with all the support you give us to ensure that our children have fabulous experiences and make lasting memories. We know you love them as much as we do and they know it too. See you next year everyone for another action packed 12 months in nursery after Mrs Fenton and I have slept for a few weeks!